Earlier this month, Bulgarian voters went to the polls for the second time in just 17 months. They elected a fragmented National Assembly, though the former pro-European, center-right prime minister Boyko Borissov is likely to return to power with a minority government. One of the first decisions he will have to make is whether to proceed with the South Stream natural gas pipeline, which would carry Russian energy through Bulgaria and to Austria, Hungary and elsewhere in southern Europe. The pipeline is one of the reasons, in fact, that the previous center-left coalition government fell earlier this summer. Borissov, the most vibrant of a chiefly unmemorable group of Bulgarian political leaders, indicated he will oppose the pipeline so long as EU authorities, who are worried about competition law issues as well as security concerns, oppose it. But Bulgaria, a country that has hemorrhaged over 19% of its population in a quarter-century and which has the lowest GDP per capita (around $7,300) among the European Union’s 28 member-states, could use the jobs and investment that the pipeline would bring. With a fickle electorate and a weak mandate, it will be hard for Borissov to resist moving forward eventually with the project. Borissov, it’s worth noting, signed the original contract for the South Stream pipeline during his first stint in government. All of which could strengthen the Kremlin’s leverage for European economic sabotage. Meanwhile, neighboring Hungary’s political culture is moving closer to Russia and far away from the political norms of the European Union. Its prime minister, Viktor Orbán, announced his intentions in July of turning Hungary into an ‘illiberal state.’ Reelected in April with the same two-thirds supermajority that allowed him to revise the Hungarian constitution, rewrite election laws and enact laws restricting press freedom, Hungary’s isolation from the rest of Europe appears to be accelerating. The decision of the European Parliament last week to reject Orbán’s nominee, Tibor Navracsics, who had been slated to become the European Commissioner for Culture, will only exacerbate the growing rift between Budapest and Brussels. Hungary has been a NATO member since 1999, and as it moves closer toward illiberalism, Orbán could increasingly undermine the trans-Atlantic security alliance. For now, Serbia appears to be turning more westward than eastward, and the European Union’s sticks-and-carrots approach to Serbia has induced small steps toward normalizing relations between Serbia and Kosovo and considerably larger steps toward modernizing economic and political reforms. But Serbia’s president Tomislav Nikolić and its prime minister since March, Vučić, both tied to the center-right Progressive Party (SNS, Српска напредна странка), are former nationalists and the most pro-Russian leaders that Serbia has had in a decade. Nikolić, who narrowly won the presidency in 2012 on his fourth attempt, has maintained Serbia’s commitment to joining the European Union, but made clear in one of his first state visits to Moscow, his willingness to work with Russia, and Vučić has looked to the United Arab Emirates rather than the European for government loans. Even as EU officials try to dissuade Serbian enthusiasm over its role in the South Stream project, foreign minister Ivica Dačić, Vučić’s immediate predecessor as prime minister and a one-time protégé of strongman Slobodan Milošević, was in Moscow last week gushing over South Steam and further calling for a Serbian-Russian free-trade zone. Vučić, for his part, has scoffed at Western economic sanctions against Russia. Full EU membership is, by the most optimistic estimates, at least another decade away. If euroskeptics in the United Kingdom Independence Party, the Alternative for Germany and France’s National Front can win votes in much wealthier countries the heart of the European Union, it isn’t hard to believe that nationalists could thwart Serbia’s recent EU turn, especially if Brussels forces Belgrade into recognizing Kosovo’s sovereignty. 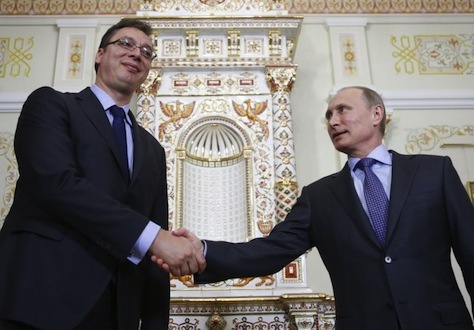 After all, Russia and Serbia share religious, linguistic and cultural ties. It’s not for nothing that Russia’s protective posture toward its ‘little Slavic brother’ was the first geopolitical domino that launched the first World War exactly a century ago. There are signs that the White House might understand the growing threat. US vice president Joe Biden made a rare call to Vučić last week in advance of Putin’s visit to Belgrade tomorrow. Taken together, the cumulative ties between Russia and its eastern allies could make it much more difficult to draw a bright line between itself, on the one hand, and NATO and the European Union, on the other. That could make it much easier, for example, for Russia to isolate Ukraine or Moldova from European influence, where pro-Russian separatists need little encouragement in the Transnistria region that curves along the Ukrainian border. During the Cold War, soft power played a significant role in the ultimate emergence of US hegemony the disintegration of the Soviet Union, while hard power led both the United States and the Soviet Union to decade-long morasses in Vietnam and Afghanistan and to the spine-chilling Cuban missile crisis. Now, in the 21st century, trans-Atlantic strategists ponder Putin’s next moves, they shouldn’t overestimate the risk of hard-power moves in Donetsk or Narva at the risk of underestimating more nuanced soft-power plays in Sofia, Budapest and Belgrade.